Not sure if Iceland should become your next travel destination? This unique country certainly deserves a spot on your bucket list, and in this post we've put together some of the most exciting experiences which can be part of your tour to Iceland! The so-called land of fire and ice welcomes everyone who is ready to see and respect the natural beauty and wild landscape of our Earth, below you can learn more about the best places to visit in Iceland. Discover volcanoes, thundering waterfalls and steaming geothermal areas. The list to fall in love with this country, especially its capital Reykjavik, could go on and on, but for now, we have prepared top 10, based on our destination specialists' opinion and travelers’ reviews. We have been organizing tours to Europe for more than 11 years, and can easily state that Iceland is awe-inspiring at any time of the year. Nevertheless, her majesty winter, without a doubt, surpasses all other seasons, mainly because of one otherworldly experience called the Northern Lights. Though there is always a 50/50 chance for witnessing this phenomenon, it is certainly advisable to add it to the top of your list. If the Aurora Lights are already there, read this guide to learn more on when it is the best time to see the Northern Lights in Iceland, and how to increase your chances of seeing these unforgettable dancing lights. The Golden Circle sightseeing route is a perfect choice if you want to cover some of the major attractions of south Iceland. The first jaw-dropping location is The Geysir Geothermal Area where you will find the oldest geyser known to humankind - Geysir, and of course, many hot pools, clay pots, and fumaroles! Your next stop is Gullfoss, a truly spectacular waterfall located in an ancient valley. You will see an incredible and remarkable phenomenon, how the Hvítá flows down Gullfoss and vanishes into the earth. The Golden Circle ends with the historical and geological wonder - Thingvellir National Park. The Midnight Sun features near the top of almost every list of things to experience in Iceland. And we are not surprised at all! Can you imagine how many more things you could do if the sun wouldn’t dip below the horizon every day? And this is exactly what you can experience in Iceland! This unique phenomenon starts around the 21st of June. Each year! The lights in the sky are magical and quite surreal, it is definitely a dream of photographers. What else can you do if you want to stay up all night? Geothermal spas, hiking, saunas, sailing, going on safaris, you name it! It is a strange sensation to visit lava beaches of black sand. You might wonder, can rocky shores surpass the so well known gold-sand beaches? Yes, they sure can! The shoreline is even more incredible in the winter, the contrast of white snow and black sand is something out of this world. There is more than one black beach but if we had to choose only one, it would be Reynisfjara with its amazing cliffs. Another not to miss beach is the glittering Diamond Beach. Visiting a Diamond Beach in Jokulsarlon you will see a changing landscape with various small ice formations and giant icebergs pushed back to shore by the waves. All resembling diamonds of course! If there is one experience that has the power to move our travelers to tears - it is a whale watching. And we can firmly state Iceland is one of the best places in Europe for this unique experience. Why is Iceland so loved by whales? There is plenty of their food in surrounding waters, plus Iceland has shallow fjords and lots of daylight hours in the summer that whales enjoy. Looking for more? Add another essential Iceland experience to your itinerary - ride Icelandic horses through the country's unspoiled nature. For example, in lava fields and green hillsides! If you decided to put Diamond Beach on your list, make sure you visit Jokulsarlon Glacier Lagoon too. Stroll around the shores of the lagoon which is actually not only gorgeous but a famous spot as well. Why? Because you get a chance to stroll where Angelina Jolie did when she was shooting a first "Tomb Raider" movie. Interesting fact, in the movie this place is identified as Siberia! If not a big fan of Angelina Jolie, no worries, quite a lot of international movies have been shot in Jokulsarlon, for example, James Bond movies " Another Day" & "A View to a Kill". In Southern Iceland you can go to the so-called Golden Circle (see point 2), but up north you will find the beautiful Diamond Circle! The route has four main attractions. First is Lake Mývatn, the 4th largest lake of Iceland (36.5 km2), settled in a very diverse area with stunning waterfalls, hot springs, steaming geothermal area, caves, and craters. Second, the mighty waterfall Dettifoss - the most powerful waterfall in Europe! Third, a majestic horseshoe-shaped canyon Ásbyrgi. The last stop is the famous fishing town Húsavík, often called the capital of whale watching. Vatnajökull National Park is an attraction not to be missed. This park covers 13% of Iceland’s surface and has a very diverse area with marvelous waterfalls, long canyons, majestic mountain ridges, steaming geothermal areas, rivers, glacial ice. As it is often stated, this is a place where the battle between ice and fire still rages, and is a must for those who are looking for adventurous activities to fill their itineraries. In Vatnajökull National Park you can take a tour of the ice caves, which means you will be walking right underneath the glaciers! And, if this is not enough, you can go climbing or hiking at Skaftafell. The capital of Iceland, Reykjavik, is a very picturesque city with many significant places. We suggest such stops: the official residence of the President of Iceland called Bessastadir. Hafnarfjörður - a port town. The futuristic Perlan dome from which you see spectacular views over Reykjavik. The renown sculpture "The Sun Voyager" which resembles a Viking Ship. The Hallgrimskirkja Church that is the tallest building in Iceland where you have a chance to walk up the stairs to see the view of the city center. Last but not least, no trip to this country is complete without visiting the famous Blue Lagoon! Apart from the incredible color of the water, this lagoon is one of the most popular of all Iceland vacation spots for its unique surreal surroundings in an ancient lava field on the Reykjanes peninsula. The geothermal water is always hot, regardless of the time of the year, usually, the temperature of the water is around 37–39 °C (99–102 °F). Not only it is a relaxing experience, but it is also healing too! The water is renown for its rejuvenating properties which are beneficial for your body as well. 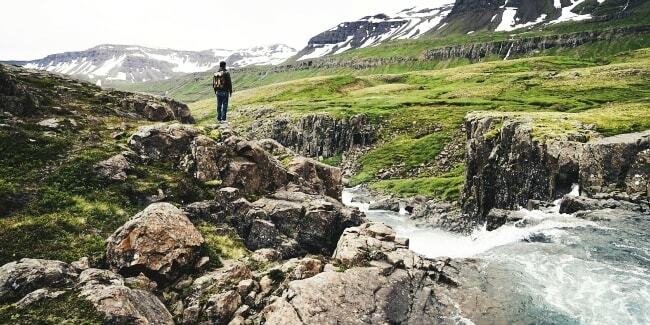 Embrace the mineral-rich water, natural elements and pure Icelandic air is a unique experience for body and mind. If you consider Iceland for your next getaway but still have doubts when to go, what to wear, or which sights to include to make it a trip of a lifetime, don't hesitate to contact our travel specialists. We can't wait to see you on one of our Iceland tours!